Does anyone out there have a Dehydrator? I do well my husband does that is, and I love to use it when I can get my hands on that thing. I recently had a bunch of Beautiful Dark Ruby red plumbs that were sitting in my fridge ready to be eaten because they were so ripe. Of course it was a 5 pound bag of them, and there was no way I was going to eat all those by myself. I had to think what am I going to do with these since I don’t want them to go to waste. Growing up as a kid my parents did not have a whole lot of money , and they would always tell me never to waste what I have on the plate cause there are children starving somewhere else. 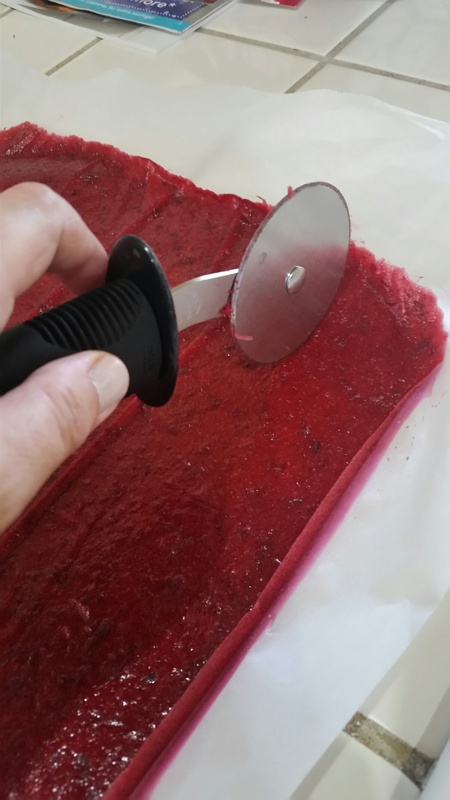 That saying has always been embedded in my head so I decided to make plum fruit roll ups. I always loved fruit roll ups as a kid it was always a treat to find them in my lunch box at school.Fruit roll ups come in so many flavors from strawberry to peach and etc. It really is not that hard to do just cut up all the plums in half pit them, and then place them cut side up on the cookie sheet. 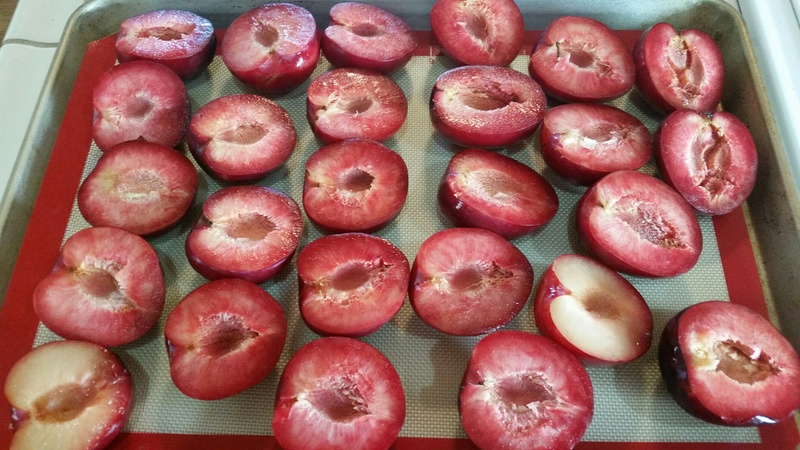 Preheat your oven at 400 degrees, and then cook your plums for about 20 minutes, if you have small ones check on them to make sure you don’t dry them out to fast .After 20 minutes in the oven take them out and let them cool off. I actually let them sit out on the counter for awhile probably like 3 hours. The next step is if you have a food Processor put the plums in the food processor with 3/4 cup of granulated sugar. Blend the Plums until smooth. Next take out your cookie sheets and line them with parchment paper.Then pour the mixture on the parchment paper making sure the level of the liquid is about 1/4 to 1/8 of an inch thick, and use a spatula to evenly spread the plum liquid. Once you are done smoothing the liquid evenly then you put the cookie sheets in the Dehydrator for 9 hours at 140 degrees. You want to make sure the fruit has a nice shinny surface to it and not soft or sticky. If you do not have a Dehydrator you can always do this in your oven at the same temperature for the same length of time. 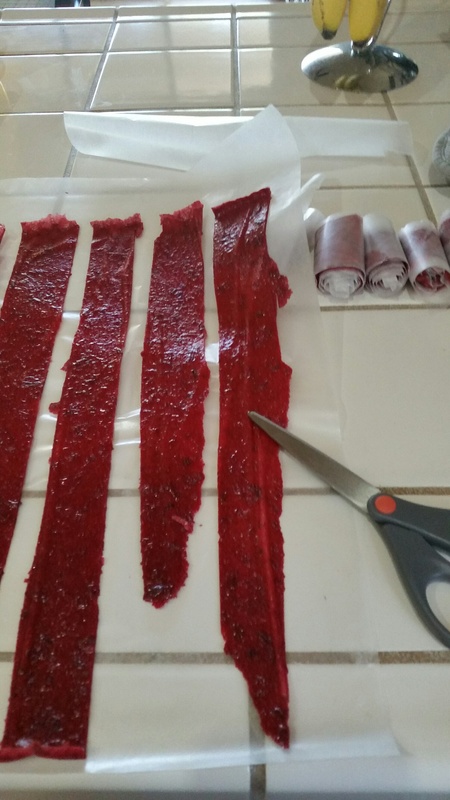 Once the roll ups are done what I like to do is cut up strips of wax paper put them to the side, and then cut up the Fruit in long strips with a pizza cutter so much easier. 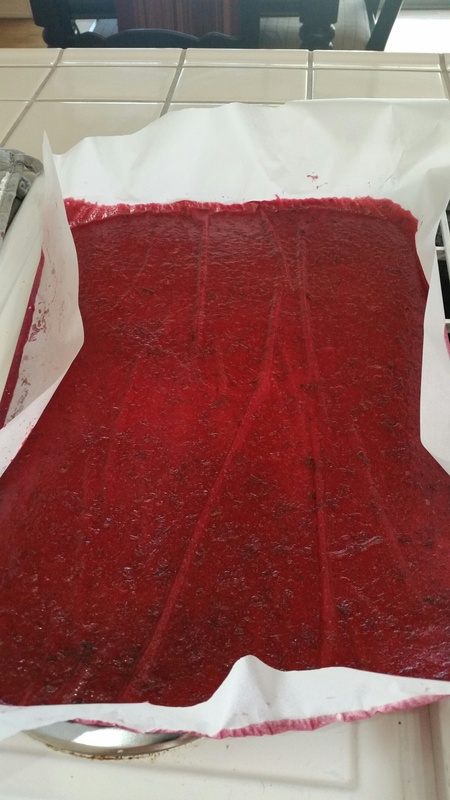 Take the fruit strips and place them on the wax strips and roll them up small. There you have it home made plum roll ups with out all those preserves. It really is not that hard to do, and I love the fact I made them, and they are not filled with a lot of preserves.